One of the Haitian children found with the Americans, at the SOS Children's Village in January. Port-au-Prince, Haiti (CNN) -- Nearly all of the 33 Haitian children whom American missionaries allegedly tried to take out of the earthquake-ravaged nation were reunited Wednesday with their families, weeks after they were separated. The children, who range in age from 4 months to 12 years old, have been living in SOS Children's Village, an Austrian-run orphanage in northern Port-au-Prince, since late January, when the 10 Americans they were with were arrested at the Haitian-Dominican Republic border. On Wednesday, 32 of the children were taken home by at least one parent. Authorities are still working to verify the paperwork from the parents of the remaining child, a 9-year-old girl, SOS Children's Village said. It was not immediately clear when she could be reunited with her family. 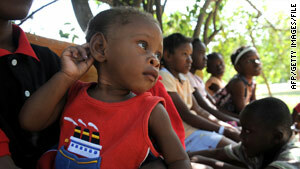 Haitian authorities acknowledged that it had taken them some time to return the children. "Authorities wanted to ensure that the children were given back to the right parents," said Jeanne Bernard-Pierre, the general director for Haiti's Institute of Social Welfare. The 10 Americans face charges that including kidnapping of minors for trying to take the children out of the country without required paperwork on January 29, more than two weeks after the devastating magnitude 7.0 earthquake. Nine of them have been released on bail and left the country. They also are charged with criminal association and arranging irregular travel. The group's leader, Laura Silsby, remains jailed in Port-au-Prince. She admitted that she did not have any documentation for the children from Haitian officials. Silsby originally said the children were orphaned or abandoned, but it has since been determined that all have at least one living parent, according to the SOS Children's Village. Some parents said they placed their children in Silsby's care because they thought that would ensure they would have a better life. The Americans said they had planned to house the children in a converted hotel in the Dominican Republic and later move them to an orphanage. The January 12 earthquake killed more than 200,000 people and flattened large portions of the capital city and surrounding areas.